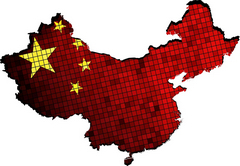 Companies setting up subsidiaries in China. Two more new top level domain name companies are establishing ties in China to tap into the growing appetite for domain names there. Today, Minds + Machines announced it has appointed ZDNS as its local infrastructure partner in China. The company is also establishing a wholly foreign-owned enterprise in China called Beijing Ming Zhi Mo Si Technology Company Limited. Allegravita is advising Minds + Machines on its China strategy. Yesterday, Famous Four Media announced that it is also establishing a wholly foreign-owned enterprise. Setting up shop in China, which comes with special rules from the Chinese government, will help them gain a foothold in the rapidly-growing Chinese market for domain names. While people in China can register many new top level domain names, such as .XYZ and .Club, they cannot actually use them for websites yet. .Com is a special case given its history and size, but even .com registry Verisign recently made concessions to the Chinese government.